This page should be updated due to game changes. Reason: Missing: Player made info (fits, summary, tactics etc.). 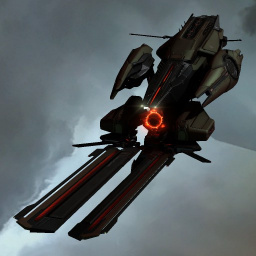 A cruiser-sized vessel that is oriented towards remote armor repair and seems to be the Collective's equivalent of a support cruiser, the Rodiva is another Triglavian design that has proven adaptable to capsuleer technology, as with previously recovered examples of ship architecture recovered from Abyssal Deadspace. The Rodiva's remote repair systems are considerably enhanced by adaptive armor-repair mutaplasmids that are used as nanite feedstock for its remote repair projectors. As the armor-repair mutaplasmid stream is able to adapt itself in real-time to specific target ship conditions far more efficiently than standard armor-repair nanites, the efficiency of armor repairing performed by the nanite stream on a given target increases over time towards a maximal repair output. The Rodiva is a Triglavian Logistics Cruiser, introduced with the Onslaught expansion in Late 2018. It's repair power is initially a bit lower than a regular T1 Logistics Cruiser, but can eventually repair at the rate of T2 Logistics Cruisers if given the opportunity to spool long enough on a single target. Further information about additional or recommended skills to pilot Rodiva for a specific or it's common role(s) can be written here. No sub-article about Rodiva roles or piloting tactics. You can write them here. Notes can be added here. This page was last modified on 1 April 2019, at 10:40.